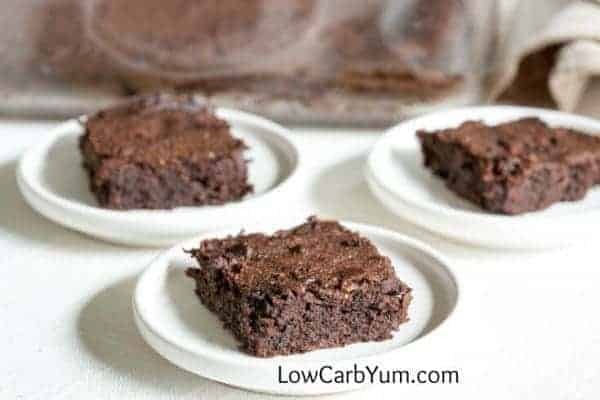 These low carb brownies are so rich and fudgy it’s hard to distinguish them from the real thing. A welcoming treat for the chocolate lover’s sweet tooth. Who doesn’t love rich and fudgy brownies? I just can’t resist them when they melt in your mouth. I’ve always made my brownies from scratch. 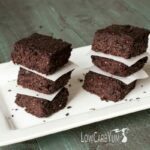 These low carb brownies are based on my favorite brownie recipe. Adding polydextrose is the secret to a getting moist and fudgy brownies. If you are sensitive to it, you could try using a fiber sweetener like VitaFiber or Sukrin Fiber syrup. The other thing to remember is that chocolate takes on an odd flavor when Splenda is used as the sweetener. So, you’ll want to use other sweeteners. I like to use a mix of erythritol and stevia. Swerve is also a good choice. 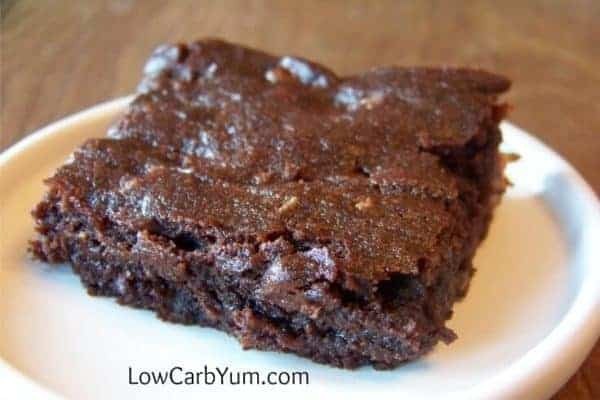 The original recipe for these low carb brownies uses Carbquik. It’s is an excellent low carb flour option. However, it’s made from wheat so it’s not a good choice for gluten-free. So, I’ve provided an alternative using almond and coconut flour. 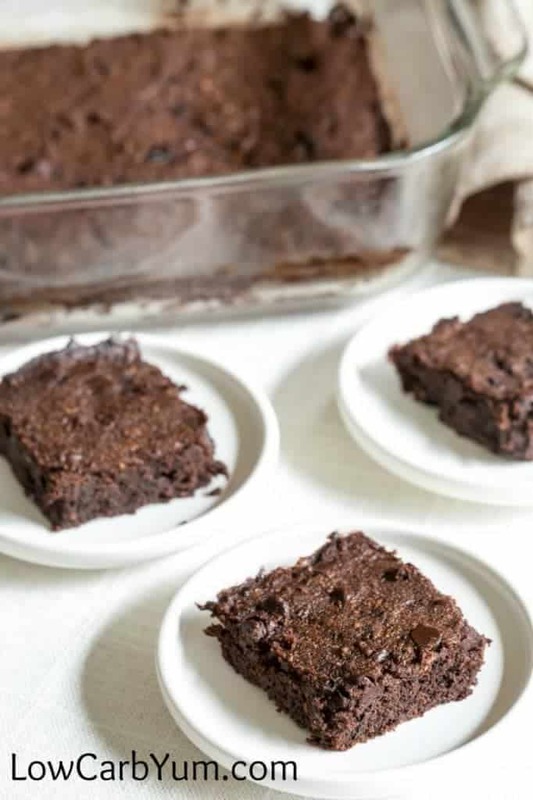 If you’ll be replacing the Carbquick in these low carb brownies with almond and coconut flour, you’ll want to wait to eat them. I’ve found that letting the brownies sit in the refrigerator overnight makes them much better. I also like to take the brownies out slightly undercooked. This makes them very moist and prevents dryness. They may look raw when taking them out, but let them cool completely and they will be fine. If you want extra rich brownies, you may want to frost them with a chocolate icing. 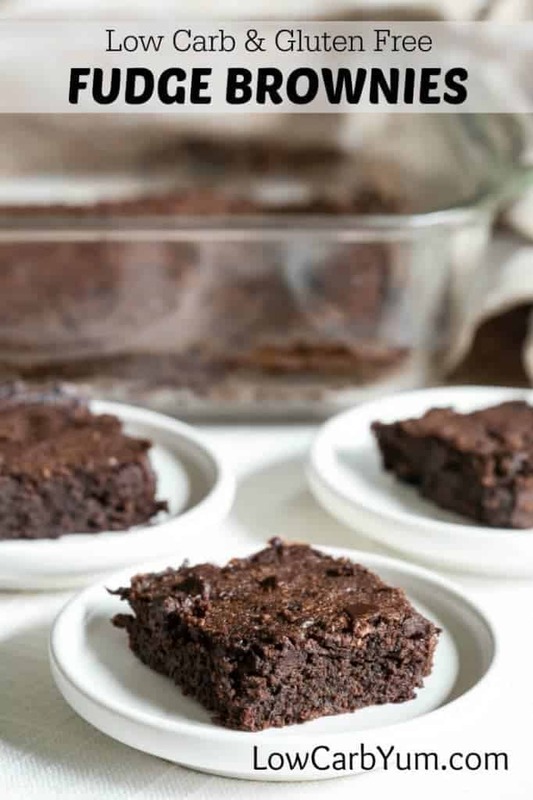 You could use the frosting recipe from my zucchini brownies. Just click here for chocolate frosting recipe. 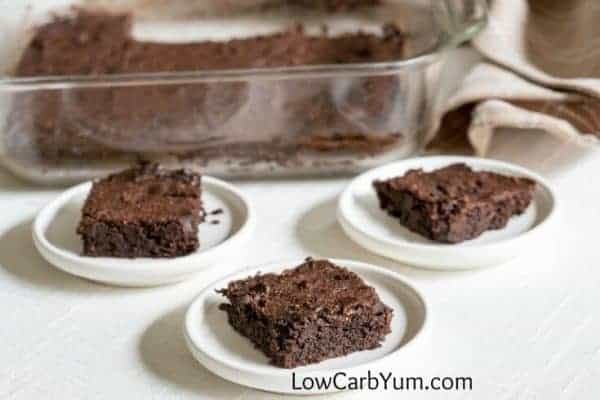 These fudgy low carb brownies taste very close to the original high carb recipe that I used to make. But, It’s good to know that they aren’t going to add extra fat build-up on my waist! Sometimes I enjoy nuts in my chocolate brownies. So, I added an optional amount of nuts that could be added for those who want them. Ingredients can vary. You may need to adjust accordingly. However, I think you’ll agree that these treats are a great way to get a chocolate fix. I often eat the brownie mix before baking. It’s hard to resist chocolate in any form! You can see the difference in texture that you get when using polydextrose. The original brownie photo in the recipe card used both polydextrose and Carbquik. All the other photos are what it looked like when I omitted the polyD and replaced the Carbquick with 6 tablespoons almond flour and 2 tablespoons coconut flour. Taking gluten free low carb brownies out before they test done will help them be more fudgy. And, letting them sit overnight in the refrigerator improves texture too. 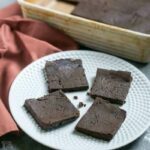 These low carb fudge brownies are so rich and fudgy it's hard to distinguish them from the real thing. A welcoming treat for the chocolate lover's sweet tooth. Preheat oven to 325 degrees F (165 degrees C). Grease and flour an 8×8 inch pan. In the large bowl of an electric mixer, cream 1/2 cup butter or margarine, softened. Add 2 eggs, 1 at a time, beating well after each addition. Mix dry ingredients. Add dry mix to egg mixture and beat until smooth. Spread into greased pan and bake 30 minutes in the preheated oven, until a toothpick inserted into the center, comes out clean. 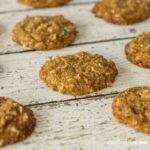 Carbquick can easily be replaced with a blend of almond and coconut flour in a 4:1 or 3:1 ratio. I like to use about 6 tablespoons almond flour and 2 tablespoons coconut flour. You can add a bit of xanthan gum (about a teaspoon) to help with texture. If PolyD is omitted, some may want to add a little more sweetener or a touch of blackstrap molasses. You can also replace it with a tablespoon or two of fiber syrup like Vitafiber or Sukrin clear. I’m finding it hard to follow this brownie receipe with all the different options. 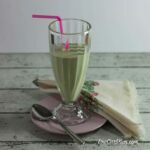 Can I substitute the PolyD, eryth & stevia for just 1 ingredient? If so, how much of something else? Or 2 ingredients would be ok if I know how much. I’m new to the low carb cooking so all these sweeteners are confusing to me. I need it simple! Yes. You’ll want about a cup of bulk sweetener like Swerve or Lakanto. I made these using 2 oz. bakers chocolate instead of sugarfree chocolate chips with the Carbquick and polydextrose plus 1/2 cup of walnuts. I added 1 teaspoon of vanilla too. They were quite good, but didn’t stay together real well. Thinking of adding Xantham gum to help them be less crumbly. Thank You, when you make with the almond or coconut flour do you add baking powder as well? I don’t add baking powder or soda, but it can be added if you want more rise. I am a big fan of your blog . Follow you every time . The title of the recipe is wrong. First of all , Carbquick is full gluten flour , so it is not Gluten free. Second and most important , its ingredients are not low carb at all ( soy flour, enzyme enriched wheat, high protein patent wheat flour . This is a real joke . it is a scam . I am an ex diabetic, and used those Carbquick. My sugar level spiked to the sky when used those products . I know that part of you making money is adverting those product , but not at the cost of people health .Same “joke ” was related to Ezekiel bread, which was recommended to the gluten free blood type (Sprouted grains) . Amazingly , no one bothered to look at the label to see that it was loaded with vital gluten . Greed is the key in America . Our job is to have the knowledge no to fall to those traps ,which make us sicker and make them richer . I wish someone will test in the laboratory all this product and publish the real nutrition fact , so people will wake up. . The photos were made without Carbquik and used the gluten-free option in the notes. I suppose I could change the recipe to reflect that. I no longer use Carbquik or anything with gluten. I think you should have read it before you were so quick to judge. She gave a gluten free alternative. You really owe her an apology. Good to know that blackstrap molasses is a good sub! Not by itself, but as an ingredient in a small amount when divided between all the servings, it isn’t much. However, strict keto would certainly omit it. 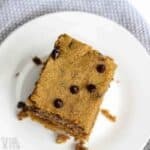 Lisa Ketcham- Not sure if you thoroughly read my comment but I added 1 teaspoon of molasses to the recipe. 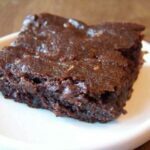 1 tsp literally adds 3.7 carbs to the entire recipe, which is less than 0.25 added carbs per brownie. 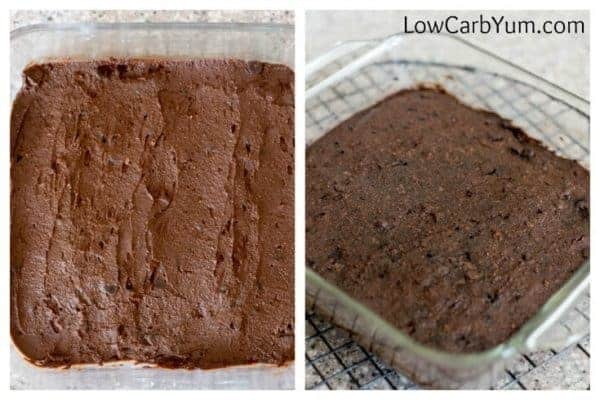 I eat around 20-30 carbs per day and a few of these brownies would fit into my macros no problem. I make my own sugar free carb free chocolate pieces, bars, etc by melting unsweetened bakers chocolate and adding erythritol (or other sweetener) and a little butter. You can add cream to make it more milk chocolate flavor, too. I add a bunch of cream to make frosting. I’ve done that too. And, it’s much cheaper than buying sugar free chocolate. Not at all! 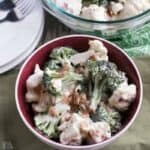 Just use about 1/4 cup additional sweetener or to taste. Hi, In the recipe ingredients it says 1/4 cup of butter, but in the instructions it says 1/2 cup. Which one is it? Thanks! It should be 1/2 cup (a whole stick). These brownies look delicious. I am thinking of making them, but would like to know how many carbs/brownie. I am diabetic, so I need to keep track of my carbs. Thank you. I got about 9g total and 2g net. I loved Carbquik before going gluten free. That’s really my only issue with it. Hpw many calories in the brownies? It’s about 100 calories per brownie. Just curious — why do you no longer use the polydextrose? I happened to see the product on a product website (Honeyville) and I was researching it. Most of the info seems to be really old — can you give info regarding why you don’t use it anymore? Even small amounts of polydextrose gives me gas and bloating. It’s just too painful for me to consume so I avoid it. I did not make these brownies, but after reading all the ingredients in the products you suggested, in good conscience, I can’t make them using your suggested products. These products, especially the Carbquik and polydextrose include synthetic ingredients which are horrible for your body. I no longer recommend Carbquik or polyD. Carbquick can easily be replaced with a blend of almond and coconut flour in a 4:1 or 3:1 ratio. PolyD isn’t really needed and can be omitted. If PolyD is omitted, some may want to add a little more sweetener or a touch of blackstrap molasses. Please, be a little more specific about the extra sweetener. Is it the stevia extract or the swerve. How much is a little? These are ingredients I’m not familiar with. You could add any sweetener, but Swerve would be better as it has bulk. I would only add a little at a time to get the right sweetness. You can sub in a little extra sweetener. If you want a little chewiness, you may want to use a fiber syrup like Sukrin. 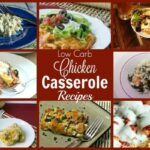 Is there another way to substitute the Carbquick? 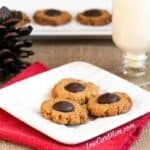 I’d use about 6 tablespoons almond flour and 2 tablespoons coconut flour for 1/2 cup of Carbquik. 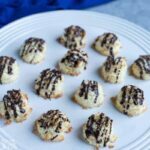 I tried these about 2 weeks ago for my husband (chocolate freak!). He LOVED them. We made them again this past weekend for my daughter’s birthday…we did a lil’ tweaking and used as a base for a “molten” type of brownie dessert: Fantastic! Thanks for the feedback! The molten dessert sounds great. I’ll have to try that. 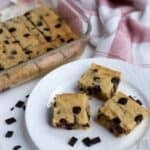 I know your post is old, but are you still making these brownies, and have you perfected them ingredients wise? Would really like to know your specific amounts and types of sweeteners, flours, and such. Did you use the poly d or Suriname? There was much variation in options here. My husband loves brownies and I want to make them for his birthday in a few days. I buy the ingredients online at netrition.com but they may also be available at local Natural Food stores. Some of the ingredients can be bought at honeyvillegrain.com as well as amazon.com. Looks great but where do you get the ingrediants?